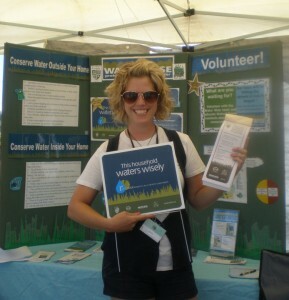 The Water Wise program is an initiative of the Township of Langley’s Water Resource Management Strategy. It includes a public outreach and educational program delivered annually throughout the Township with the help of Langley Environmental Partners Society (LEPS). Since 2002, the Water Wise program has visited communities and neighbourhoods informing residents about the importance of local groundwater resources, and providing practical ways to conserve and protect our supply. Water Wise Challenge: Go Golden and Win! 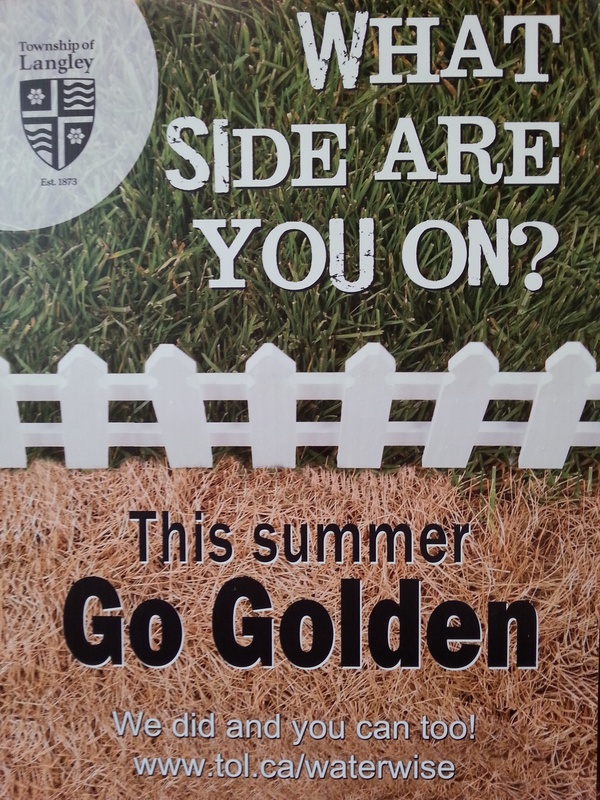 Go Golden and let your lawn go brown during the summer months and limit lawn sprinkling, a healthy lawn only need 1.5 inch of water, or 1 hour per week. Or better yet, stop watering your lawn during the summer months, your lawn will go dormant and turn green again when fall rains return. Display a Water Wise lawn sign in your yard to show your community that you are conserving water this summer, and you could* win a RAIN BARREL! You will then be entered in a draw for a chance to win a Rain Barrel to support further water conservation efforts in your yard and garden! *To remain eligible, your sign must be on display all summer, and you must continue to show that you are living up to the Water Wise message on your sign. Rain and snow falls in drainage areas called watersheds up in the mountains of the North Shore and Coquitlam. This water supply is pristine, natural and protected. The watersheds are protected from urban development, closed to public access and managed as natural assets of the highest importance to the region we live in. Three watersheds provide drinking water for the Lower Mainland; Capilano and Seymour Watersheds on the North Shore, and Coquitlam Watershed in Coquitlam. These watersheds supply drinking water for nearly 2.5 million residents from these sources. 50% of the water consumed in Langley Township is supplied by the Greater Vancouver Regional District drawn from the Coquitlam Watershed. Residents of the City of Langley consume water that is drawn from the Coquitlam Reservoir. 50% of Township of Langley residents are dependent on groundwater, either through private wells individual property owners are responsible for, or municipal wells, for which the Township manages. Our groundwater resource is shared with many users, including agriculture, industry, and the natural environment. In some areas, it is being used faster than it can replenish. The average BC resident uses about 465 L of water per day! Well above the national average of 329 L per day. That’s the equivalent of about 118 4 L milk jugs per day! It’s time we challenge ourselves to conserve this precious resource. To find out how to reduce water use, both inside and outside the home click here. Did you know that we use our drinking water to flush our toilets and water our lawns and gardens? Township of Langley residents and businesses use 12.8 million m3 of water each year; equivalent to filling 5,120 Olympic sized swimming pools! Water Wise Gardening means selecting and maintaining native plants that can survive long periods without water. These plants naturally use less water to stay healthy during months when rain water is limited, helping to reduce water consumption in the garden. There are many species of plants available at local nurseries that can thrive in our dry summer and wet winter conditions. Examples of native drought-resistant plants can be found here. The Invasive Species Council of BC provides a handy brochure called ‘GROW ME INSTEAD’ giving gardeners native drought-resistant alternatives for common garden favourites.